Physical exercise is associated with reduced blood pressure (BP). Moderate-intensity continuous exercise (MCE) promotes post-exercise hypotension (PEH), which is highly recommended to hypertensive patients. However, recent studies with high-intensity interval exercise (HIIE) have shown significant results in cardiovascular disease. Thus, this study aimed to analyze PEH in hypertensive subjects submitted to HIIE and compare it to post MCE hypotension. 20 hypertensive adults (51 ± 8 years), treated with antihypertensive medications, were submitted to two different exercise protocols and a control session. The MCE was performed at 60–70% of VO2 reserve, while HIIE was composed of five bouts of 3 min at 85–95% VO2 reserve with 2 min at 50% of VO2 reserve. The following variables were evaluated during exercise, pre- and post-session: clinical BP, heart rate (HR), double product, perception of effort, body mass, height and body mass index. 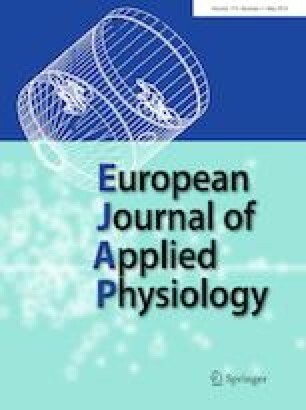 Systolic BP decreased after exercise in both sessions, showing greater decrease after HIIE (− 7 ± 10 and − 11 ± 12 mmHg, after MCE and HIIE, respectively, p ≤ 0.01). Diastolic BP also decreased after both sessions, but there were no significant differences between the two sessions (− 4 ± 8 and − 7 ± 8 mmHg, after MCE and HIIE, respectively). Both exercise sessions produced PEH, but HIIE generated a greater magnitude of hypotension. The HIIE protocol performed in this study caused a greater cardiovascular stress during exercise; however, it was safe for the studied population and efficient for reducing BP after exercise. This study was financed in part by the Coordenação de Aperfeiçoamento de Pessoal de Nível Superior—Brasil (CAPES)—Finance Code 001. AM, FCP and VZD conceived and designed research. FCP, LFMS, GAB and WOV conducted experiments. AM, FCP and FTM analyzed data. AM, FCP, FTM and VZD wrote the manuscript. All authors read and approved the manuscript. The authors report no relationships that could be construed as a conflict of interest.